For years, the best amateur teams in Canada were easily able to win World Championships and Olympic gold medals, but by the 1960s this was no longer true. Canada's top amateur clubs found themselves unable to compete with the Soviet Union and other top European countries and, denied the use of professional players by the International Ice Hockey Federation, Canada withdrew from international competition in 1970. Canadian fans were longing to see a series that would pit their best professionals against the best the Soviets had to offer. In September of 1972, they got their wish! Most Canadians expected the 1972 Canada-Russia series to be a one-sided win for the NHL's best professionals. Certainly the Soviets had dominated World and Olympic play since 1962, but they were only amateurs. When Canada scored twice in the opening 6:32 of game one at the Montreal Forum on September 2, 1972 it appeared that Canadians had been correct. "Until then," recalled Team Canada assistant coach John Ferguson, "NHL players never worked on their upper-body strength and seldom used off-ice training. Sure, a few jogged in the summer, but, mostly, players came to training camp and skated themselves into condition." This wasn't enough against the supremely fit Soviets. 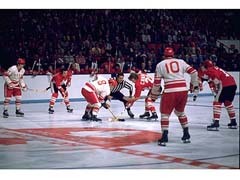 Team Canada lost on that hot September night and the resulting 7-3 victory by the USSR sent shock waves across Canada. Valeri Kharlamov scored twice that night, Vladimir Petrov, Boris Mikhailov and Alexander Yakushev had singles. A young goaltender named Vladislav Tretiak made 29 saves. Few Canadians knew those names at the start of September. By the end of the month they were as familiar as Esposito, Henderson, Cournoyer and Dryden. Coach Harry Sinden shuffled his lineup for game two in Toronto and the result was a 4-1 Canadian victory, but Tretiak was magnificent in a 4-4 tie in game three at Winnipeg. Game four saw Team Canada take several careless penalties en route to a 5-3 loss. Fans in Vancouver booed the Canadians loudly, inspiring Phil Esposito to deliver an impassioned speech in a post-game television interview: "To people across Canada, we're trying our best . . . We're all disappointed, disenchanted. I can't believe people are booing us. If the Russians boo their players like some of our Canadian fans-not all, just some-then I'll come back and apologize." Esposito's speech marked a turning point in the Canadian squad's evolution as a team. "It was a war," Esposito would later say, "and yes, hell for us whether we wanted it or not." Canada trailed 2-1-1 in the eight-game series and played two games in Sweden en route to Moscow in order to get familiar with the larger European ice surface. Three thousand Canadian fans had arrived in Moscow and they helped boost team morale. Especially after game five on September 22 when Team Canada let a 4-1 lead slip away in a 5-4 defeat. "We were having a rough time in Moscow with the lousy hotels, phone calls to the players' rooms in the middle of the night, the Russians snatching much of the food we had sent over for the team, especially the steaks and beer, and the terrible officiating by the European officials," recalls Harry Sinden. " But a long cheer at the end of the first game in Moscow by the Canadian fans was a big lift for our spirits." Game six produced a three-goal span within 1:23 of the second period, with Paul Henderson's goal holding up as the game-winner as Team Canada overcame more pro-Soviet officiating for a 3-2 victory. Henderson was again the hero in game seven when his goal at 17:54 of the third period gave Canada a 4-3 victory that evened the series at 3-3-1. Very few Canadians who were alive on September 28, 1972 did not watch the game on TV or listen on radio as game eight was carried live in the mid-afternoon. Absenteeism was high at work places across the country and schools suspended classes to allow students to watch the game, many of them assembled in auditoriums or gymnasiums. The game started badly for Team Canada, with referee Josef Kompalla issuing fringe penalties that allowed the Soviets to score a pair of first-period power-play goals and build up a 5-3 lead through two. Goals by Phil Esposito and Yvan Cournoyer allowed Team Canada to tie the game midway through the third. In the dying moments, Paul Henderson corralled the rebound from a Phil Esposito shot, but his own shot was stopped by Tretiak. With 34 seconds left, Henderson slipped his own rebound past the Soviet netminder. Team Canada had a thrilling 6-5 victory. An entire nation rejoiced! "The Canadians battled with the ferocity and intensity of a cornered animal."